The Vietnamese multicultural, Modern Fusion wedding took place at the Mandarin Oriental Hotel in Las Vegas. Las Vegas was the first of many vacations the couple taken together, and it was where they fell in love. It was the perfect destination for their wedding for their 100 guests. According to the Vietnamese tradition, the celebration started with a tea ceremony the day before the wedding in her sister's house, where the groom’s family made a trip to the bride’s home with gifts to officially ask permission to receive the bride, than after paying their respects to their ancestors, followed by a tea ceremony. It also allowed for their families to meet before the actual wedding. Mandarin Oriental, their wedding location is the only Forbes triple five-star luxury hotel at the heart of The Strip, with breathtaking views of the city and the desert. The hotel offers the perfect mix of style, serenity and luxury. An intimate venue with a modern and classy look where they were able to customize to their tastes. A stylish location set against the glittering backdrop of the bright city lights. Their guests could step outside and see the Las Vegas lights then return to the reception to party with family and friends. On their Wedding day we started with getting ready images at the bridal suite and than in the grooms room, Than we walked around the property to get some images of the bridal parties separately before their wedding ceremony. After their ballroom ceremony and family pictures we went to create images with the wedding party together and just the 2 of them around the property before we headed back to their reception. 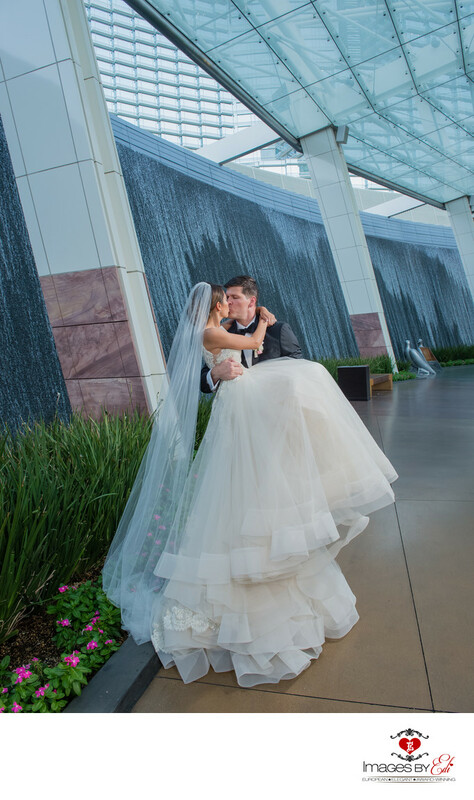 During this time we created this image by the Aria Waterfalls, what is one of my favorite images of their wedding. I feel that this image captures their love perfectly. The bride changed into three different gowns during the reception. She wear a beautiful princess Western white wedding gown during the ceremony and the first part of the reception, a second Western dress at the end of the evening and during the dancing, and a third traditional Áo dài during the traditional table visits. During the reception, the groom and bride visited each table to thank their guests for coming. In return, the guests gave envelopes containing wedding cards, money gifts and a blessing to the newly wedded couple. Location: Mandarin Oriental Las Vegas, 3752 S Las Vegas Blvd, Las Vegas, NV 89158.